Ancient Egyptian art consisted of a rich variety of different forms including painting, sculpture, architecture, and others. This style of art flourished in the ancient Egyptian Kingdom between 3000BC, when it was formed, until around 100BC. Ancient Egyptian art had its peculiar characteristics and is considered the historical heritage of Egypt. In the modern times, much of this art has been discovered on ancient tombs and monuments and thus it bears rich religious significance. Among the most important components of Egyptian art, we can include depiction of humans and nature with symbolic and religious significance. The Insides of the tombs and monuments were commonly painted to provide company to the dead and to preserve their memory. The art of the ancient egyptians can be broadly categorised into three main types, paintings, sculpture, and architecture, although types of ancient Egyptian art are not necessarily confined to just these three domains. Works of painting have been found in abundance in tombs, temples, and palaces. A common practice used before painting was to use a layer of coarse mud plaster to make the rough surface smooth. As for sculpture, the most common technique that was used in ancient Egyptian art was “sunk relief” which was a specific form of sculpture. This convention became famous as early as Dynasty I and continued to be employed subsequently. Finally, the architecture of ancient Egypt in the form of grand temples and monuments like pyramids has survived the ravages of history for thousands of years. 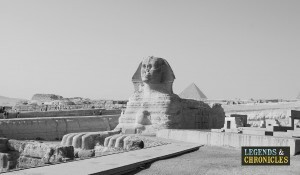 The mighty Sphinx of ancient Egypt still stands proud to this day. This cultures art’s history can be traced back to prehistoric times, before Egypt was unified into a single kingdom. The entire history can be classified into various periods such as early dynastic period from 3000BC to 2680BC, the period of the old Kingdom from 2680BC to 2259BC, the period of Middle Kingdom from 2258BC to 1786BC, and others. During the last period of ancient Egyptian art history, it was blended with Roman art because of the conquest of Egypt by Rome. Various techniques and innovative styles were used in ancient Egyptian art. A common element of ancient Egyptian art style was symbolism which depicted itself in the portraits and paintings of pharaohs and gods. Figures of animals had important symbolic significance and were used to depict the nature and powers of gods. Another quintessential Egyptian art style was the sculptures of pharaohs which a certain way of depicting them with their beards and crowns. Perhaps the most unique among all styles was Amarna art which became widespread during the Eighteenth Dynasty. This art style is distinctive due to its sense of movement and activity in the images. Further, the depiction of human body in the paintings of this style is different from previous art styles. For instance, compared to the depiction of men with perfectly chiseled bodies in previous styles, Amarna art had paintings of men with certain feminine characteristic such as large lips and prominent breasts. 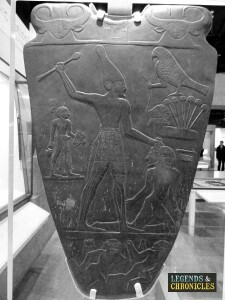 A narmer palette exhibited at the Royal Museum in Ontario shows the skill and craftsmanship of Egyptian art. Painting was naturally the most important part of this cultures art. Paintings have mainly been discovered in tombs, monuments, and temples. Before painting a certain surface, it was common to whitewash it or use a layer of coarse mud plaster to make it smooth. Various minerals were used in the painting process and were chosen according to their resistance against strong sunlight. It is not clear what binding material was used in Egyptian paintings, materials like egg tempera and various other resins have been suggested. It was also common to apply a varnish which acted as a protective coating and extended the lifetime of paintings. While there aren’t any names of famous ancient Egyptian artists that have survived history, the famous works of art have certainly stood the test of time. The oldest known masterpiece of art is called Narmer’s Palette. Egyptologists generally identify Narmer with Pharaoh Menes who unified Upper and Lower Egypt into a single Kingdom and was the first ruler of the First Dynasty. Similarly, another masterpiece is the Statue of Khufu (Cheops) which was discovered in the ancient necropolis of Abydos. Among the paintings, the Egyptian Book of the Dead has particular significance. 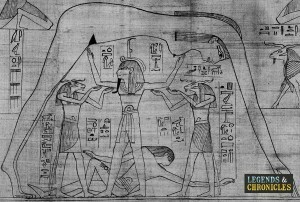 It was a scroll consisting of various paintings serving as an introduction to the Underworld where the ancient Egyptians believed the dead people were sent. It was common to bury the Book of the Dead with the rich people. But while these and other famous masterpieces of art have survived, nothing is known about the famous artists who created them. A drawing on papyrus depicting the air god Shu. Other than the Book of the Dead, Narmer’s Palette, and Khufu’s Statues, there are various other paintings and sculptures that depict the grandeur of ancient Egyptian art. Among other famous ancient Egyptian art works, the astronomical ceiling at the tomb of Senenmut is an unrivalled masterpiece of architectural beauty. It is the world’s oldest map of its kind and is divided into two parts, the northern and southern hemisphere. The southern hemisphere consists of stars and planets visible to naked eye and the northern hemisphere consists of the twelve months of ancient Egyptian calendars. Other famous art works include the statue of Thutmose III, Nefertiti Bust, and the Golden Death Mask of Tutankhamun. The richness and variety of the art of ancient Egypt is unrivalled and it is rightfully considered a wonderful heritage of human history. Other than paintings and sculptures, the grand structures such as pyramids and temples built during various periods of ancient Egypt are a testimony to human creative prowess. Other art forms prevalent in ancient Egypt include faience, pottery, and papyrus paintings. Hieroglyphs were also an important component of ancient Egyptian art and consisted of pictures and symbols representing various sounds and words. There were more than 700 words used in these hieroglyphs which were first decoded by French Egyptologist Jean-Francois Champollion when uncovering the rich heritage of ancient Egyptian art. The Egyptians certainly left us with a wealth of treasures to marvel at and this includes Artworks that can be seen in many museums across the world.